Hello and welcome to the 330th installment of the SWD. Turkey-backed Free Syrian Army, backed by Turkish Air and Land Forces captured five localities from the Syrian Democratic Forces’ YPG in Afrin region, as a part of the operation ‘Olive Branch’ (AR: Ghasin al-Zaytun, TR: Zeytin Dalı). Free Syrian Army captured Tellat al-Hawiz, Jabal al-Sheikh Khoruz, Sheikh Khoruz Wastani, Sheikh Khoruz Tastani, and Sheikh Khoruz Fawqani in Bulbul subdistrict. However, YPG reported that two Free Syrian Army’s elements and an ACV-15 were captured in Sheikh Khoruz area yesterday. 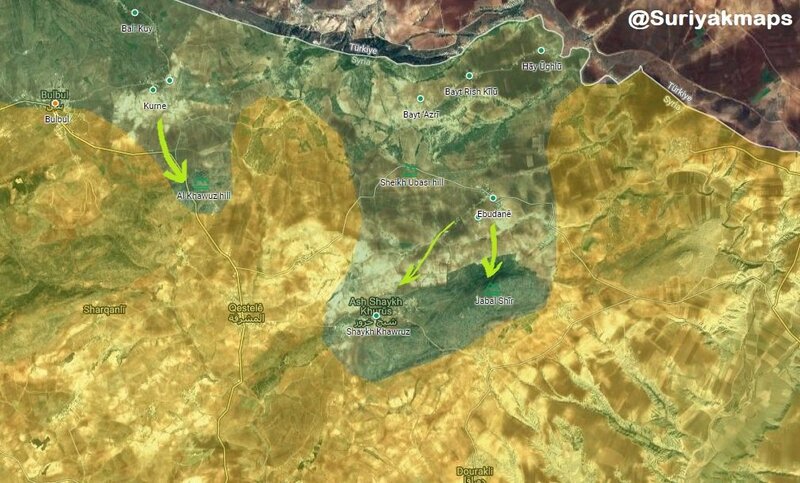 Reports suggest that six YPG‘s elements were killed during the clashes for Jabal al-Sheikh Khoruz. Russian Air Force conducted air raids over Maarat al-Numaan, Deir al-Sharqi, and Talmans in Idlib governorate. According to the reports, three civilians were killed and six wounded by the air raids over Maarat al-Numaan. Rebel operations room Dahar al-Ghaza, backed by Hayat Tahrir al-Sham continued its attack against the Syrian Arab Army in the eastern Idlib. Hayat Tahrir al-Sham conducted an SVBIED operation against the Syrian Arab Army on Tell Kalbah front, indirectly confirming that the locality is not under the rebel control. All of the localities that were previously reported as captured by the rebels, should be treated as disputed for now, as the situation is fluid and there is a lack of evidence confirming the control over the localities. Rebel operations room Dahar al-Ghaza opened a new front against the Syrian Arab Army, east of Maarat al-Numaan. The operations room announced control of Ajaz and Sarja villages, however, reports suggest that the Syrian Arab Army recaptured Ajaz. Two Syrian Arab Army’s elements were captured by the rebels during today’s advances. Hayat Tahrir al-Sham released the commander of the Free Syrian Army’s Al-Liwa al-Sabea, Abdullah Qantar after three years of imprisonment. Qantar was accused of torturing and killing two individuals in Al-Liwa al-Sabea’s prisons, as well as siding with Jabhat Thuwar Suriya against Hayat Tahrir al-Sham (Jabhat al-Nusra then). Court initially sentenced Qantar to death, but the judiciary committee rejected the verdict and ordered reinvestigation, which led to Qantar being released. Syrian Arab Army made another large wave of advances against the Islamic State in the northeastern Hama, capturing over a dozen of localities again. Some of the localities that the Syrian Arab Army captured are Qalat Huwaysis, Abisyan, Jabal Abisyan, Rasm Khila, Abu Hamad, Andarin, Jubb Safa, Aiblatan, Ablat, Ablat Jadida, Rasm Wird, Dahiriyat, Jadidat, Khitabiyat, Abu Jame, Abu Hubaya, Aklat, Tell Halawat, Qanatir, Abu Mahlat, Buyud, Janin, Sabakh, Rasm al-Suf, Akhu Hassan, Khaflat, Tabarat Azib, Aniz, Sheikh Muzuad, Rasm Qahrt, Thaniyat Sawfani, Jubb Sukar, Jubb Hintah, Marami Bani Hilal, Tifahat, Umm Zahaymiq, Mutawasitat, Mushayrifah, Maskar Sharqi, Abu Qanat, and Abu Sawaya. Islamic State’s Amaq Agency reported that seven elements of the Syrian Arab Army were killed during the clashes in the northeastern Hama, as well as a tank destroyed with an anti-tank guided missile. Islamic State’s Amaq Agency reported that an improvised explosive device killed nine and wounded three elements of the Syrian Democratic Forces in the village of Al-Bahra in the eastern Deir al-Zour. Separately, Amaq Agency reported that Syrian Democratic Forces’ Humvee was destroyed by an anti-tank guided missile, also in Al-Bahra. Syrian Arab Army’s artillery and Syrian Arab Air Force targeted Douma, Hammouriyah, Beit Sawa, Arbeen, and Zamalka in the East Ghouta. According to the reports, 11 civilians were killed and more than 20 wounded by the targeting of Hammouriyah, while ten civilians were killed and several wounded by the targeting of Beit Sawa. Five civilians were also reportedly killed in Douma, and several wounded, including Orient News correspondent Mohammed Abdel Rahman. Rebel forces in the East Ghouta shelled Al-Qazzaz neighborhood of Damascus, Jaramana and Harasta. According to the Syrian Arab News Agency, one civilian was killed and two wounded by the shelling of Al-Qazzaz, while one civilian was killed by the shelling of Awskar neighborhood of Jaramana. Last night, Israeli Air Force conducted several raids against the scientific research center in Jamraya from the Lebanese airspace. According to the Syrian Arab News Agency, Syrian Air Defense intercepted and destroyed most of the missiles. Faylaq al-Rahman allegedly arrested a woman with Russian citizenship near Beit al-Sawa in the East Ghouta. The woman is reportedly being held in Faylaq al-Rahman’s prison. Islamic State-affiliated Jaysh Khalid ibn al-Walid publicly stoned a woman on the charges of adultery in the city of Al-Shajara, northwest of Daraa. Iraqi Security Forces foiled a suicide attack in Al-Tarmiyah, by besieging the attacker and forcing her to detonate during the encounter. Last night, the woman that attempted to conduct the suicide attack entered a school in Al-Tarmiyah and spent the night there, in preparations for the attack in the morning. Afghan National Security Forces killed two and wounded one element of the Islamic Emirate of Afghanistan (Taliban), as well as destroyed three motorcycles in Khaja Sahib Posh district. NATO-led Operation Resolute Support reportedly conducted airstrikes against the Islamic State in Derzab district. According to the reports, 25 elements of the Islamic State were killed in the airstrikes, including three fighters from Uzbekistan and one from Chechnya (Russia). Afghan National Security Forces killed five and wounded ten elements of the Islamic Emirate of Afghanistan in Darqad, Khawajah Bahawodin, and Yangi Qala districts. Islamic Emirate of Afghanistan reported that it foiled Afghan National Security Forces’ attacks in Khawajah Bahawodin district, reportedly killing eight and wounding ten elements. Islamic Emirate of Afghanistan reported that two of its fighters were killed and three wounded by the air raids over the district. Islamic Emirate of Afghanistan claimed that it downed Afghan Air Force’s helicopter during the clashes in Khawajah Bahawodin of Takhar district. The helicopter reportedly crashed in Archi (Dasht-e Archi) district. NATO-led Operation Resolute Support reported that it conducted several strikes against the Islamic Emirate of Afghanistan in the province. According to the report, Islamic Emirate of Afghanistan’s training camps were targeted, as well as several vehicles captured from the Afghan National Army destroyed. The destroyed vehicles were reportedly being converted into vehicle-borne improvised explosive devices. Afghan National Security Forces wounded four elements of the Islamic Emirate of Afghanistan in Ghaziabad district. Islamic Emirate of Afghanistan’s Al-Emarah News reported that 105 elements of the Islamic State and Hezb-e Islami Gulbuddin headed by five commanders defected to the Islamic Emirate of Afghanistan in Narang Aw Badil district. Al-Emarah also reported that several days ago 25 elements of the Islamic State defected to the Islamic Emirate of Afghanistan in Dara-I-Pech (Manogay) district. Afghan National Security Forces killed six elements of the Islamic Emirate of Afghanistan in Alingar district. Afghan National Security Forces killed six and wounded three elements of the Islamic State in Haska Meyna (Deh Bala), Chaparhar, and Nazyan districts. One of the killed elements was identified as Islamic State’s commander Qari Amin. Afghan National Security Forces also destroyed Islamic State’s headquarters. Islamic State’s Amaq Agency reported assassination of an individual allegedly spying for the United State’s Army in the city of Jalalabad, capital of Nangarhar Province. Islamic Emirate of Afghanistan’s improvised explosive device destroyed Afghan National Army’s vehicle, killing one soldier and wounding several in Nirkh area of Chaki Wardak district. Islamic Emirate of Afghanistan’s improvised explosive devices destroyed Afghan National Army’s tank and killed five soldiers in the city of Pol-e Alam, capital of Logar Province. Afghan National Police and Islamic Emirate of Afghanistan clashed in Sabari district. According to the reports, one element of the Afghan National Police was killed and another wounded in the encounter. Islamic Emirate of Afghanistan’s improvised explosive device killed two elements of the Afghan National Security Forces in the city of Khost. Afghan National Security Forces killed five and wounded five elements of the Islamic Emirate of Afghanistan in Shindand district. Afghan National Police foiled a VBIED attack in Bagh-e-Khani area of Gulran district. The vehicle contained 360 kilograms (793 pounds) of explosive materials and was supposed to be used in the city of Herat. Afghan National Security Forces killed eight and wounded 13 elements of the Islamic Emirate of Afghanistan, as well as destroyed two motorcycles in Khogyani (Wali Muhammadi Shahid) district. Islamic Emirate of Afghanistan ambushed Afghan National Police’s patrol in the city of Ghazni, destroyed a tank and killing three policemen. Two elements of the Afghan National Police were killed and two wounded in clashes with the Islamic Emirate of Afghanistan in Shalgar district. Separately, Afghan National Police’s element was killed and three wounded during the clashes with the Islamic Emirate of Afghanistan in Qarabagh district. Afghan National Security Forces killed 33 and wounded three elements of the Islamic Emirate of Afghanistan in the city of Tarinkot, according to the Afghan Ministry of Defense. Afghan National Security Forces also destroyed a vehicle and several weapons depots and ammunition caches. Afghan National Security Forces killed four and wounded ten elements of the Islamic Emirate of Afghanistan in Shah Joy and Arghandab districts. Islamic Emirate of Afghanistan overran three Afghan Local Police’s checkpoints in Terikh Nawar area of Marjah district. Nine elements of the local police were reportedly killed, while the remaining elements withdrew from the checkpoints. One element of the Islamic Emirate of Afghanistan was wounded in the encounter. Islamic Emirate of Afghanistan seized a PK machine gun and three assault rifles from the checkpoints. Islamic Emirate of Afghanistan overran Afghan National Police’s checkpoint in Awpashak Manda area of Jerashk district. Seven elements of the national police, including commander Ismael Barakzai were killed. Islamic Emirate of Afghanistan seized a PK machine gun, an RPG launcher, and two assault rifles from the checkpoints. Islamic Emirate of Afghanistan stormed Afghan National Police’s checkpoint in Mateki area of Nad Ali district, killing seven policemen in the process and forcing the remaining elements to retreat from the checkpoint. Islamic Emirate of Afghanistan also destroyed an armored personnel carrier in the encounter. One element of the Islamic Emirate of Afghanistan was wounded in the clashes. Islamic State’s sniper killed an element of Ansar Alllah (Houthis) on Jabal al-Alalib in Qaifa directorate, northwest of Al-Bayda.